AlBerto asks: What region is town of Schost'e, zip code 91483? What is language of Ukraine? I am looking to locate a person in city Schost'e, any suggestions? I think you mean the settlement called Schastia located to the north of Lugansk city (Luganskaya oblast of Ukraine). Russian and Ukrainian (official) languages are widely spread in Ukraine. We have no such services as checking for the personal info of people living in Ukraine, address, phone numbers etc. But according to the details you have mentioned in your last question all the situation is looking suspicious because today there are some good free online translation services available (like Google one). Thomas asks: Is there a village of Lohavo near the town of Muckacevo? Yes there is such village but the correct spelling is Lokhovo. It is situated to the north of Mukachevo town. Tracey asks: Thank you for finding Laki for me. Can you inform me what oblasts it is in? The settlement of Laki is located in Autonomous Republic of Crimea (Crimean peninsula) of Ukraine. Tracey asks: Where is Laka in the Ukraine? I have found the village Laki (Greek settlement) that was burned by Germans during the World War II in 1942. The coordinates of the Laki village are 44° 40' 0" North, 33° 57' 0" East. Laki is located in Crimea Republic of Ukraine. 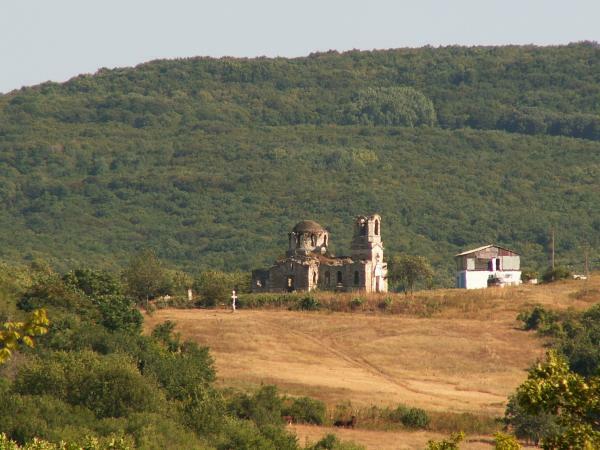 And here is the photo of the abandoned church the only remaining building of the Laki village. Dave asks: I'm curious to know about the city of Yuzhnoukrainsk. Can you tell me how big it is ( population) and how long is the commute from both Odessa and Nikolaev? Do you know of any hotels or apartments for rent there? Yuzhnoukrainsk city is located in Nikolaev oblast of Ukraine and has the population of about 39,000 (2008). The distance between Nikolaev city and Yuzhnoukrainsk is about 120 km by highway, Odessa to Yuzhnoukrainsk - 175 km. I have the following place to stay: Motel «Dobrobut», 122 km of Nikolaev-Pervomaisk highway, contact phone: +380-5136-20-484. Bev asks: Can you tell me something about the small village of Kozivka? I think you mean Kozova village (small town) located in Kozivskyi district of Ternopil oblast of Ukraine (info and photos of Kozova town). Julia asks: In which oblast is the city of Schuchinsky located? I have found no city, town or village in Ukraine named Schuchinsky. But there is town Schuchin in Grodno oblast of Belarus. Peter Senkiw asks: Can you provide me with some background or historical information regarding Podsosnov, Ukraine? I have found that Podsosnov village is located in Pustomytovskiy area of Lvov region (oblast) of Ukraine. Geographical coords: north latitude 49°45′13″, east longitude 24°21′11″ (you can try to find it using Google Earth). Postal code: 81152. Phone code: +380-3230. 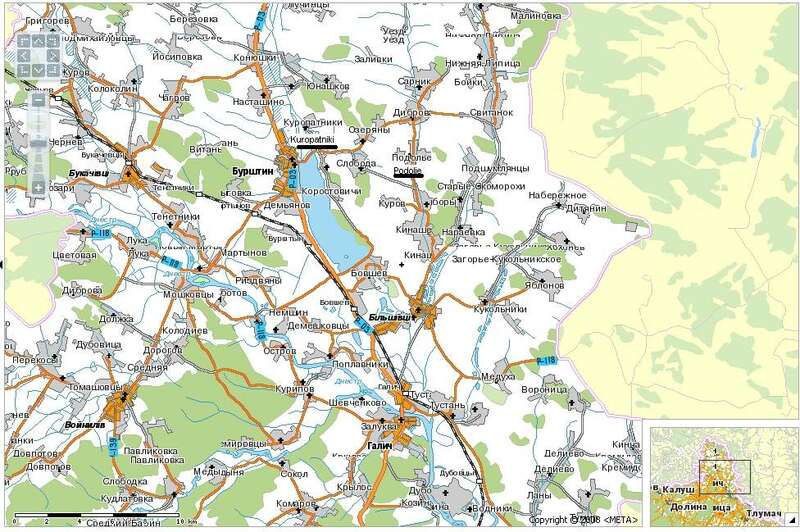 eddy asks: is there in Ukraine a village or a city called g. rahov, zakarpatskyi region? I think you mean city Rakhiv (Rakhov). It is located in the southern part of Zakarpatskyi region of Ukraine. Here is the site about Rakhiv. Steve Weaver asks: Where is the village of Belskaya Volya? The village Belskaya Volya is located in the north-western part of Rivne oblast in Vladimireckiy region. Here is the Belskaya Volya village map location. Rouzanna asks: Looking for selo Pereima near Odessa. Pereima village is situated in Baltyisk region of Odessa oblast, 18 km north from region center Balta. Here is the Pereima village location on Odessa oblast map. JP asks: I've been looking for information on a city called Ujniy. Where can I find more information? I think you mean Yuzhne (Yuzhny) city of Ukraine. Here is Wikipedia article about Yuzhne city and here are city photos (the site itself is on Russian). I think you will find more info using the correct names of the city I mentioned above. 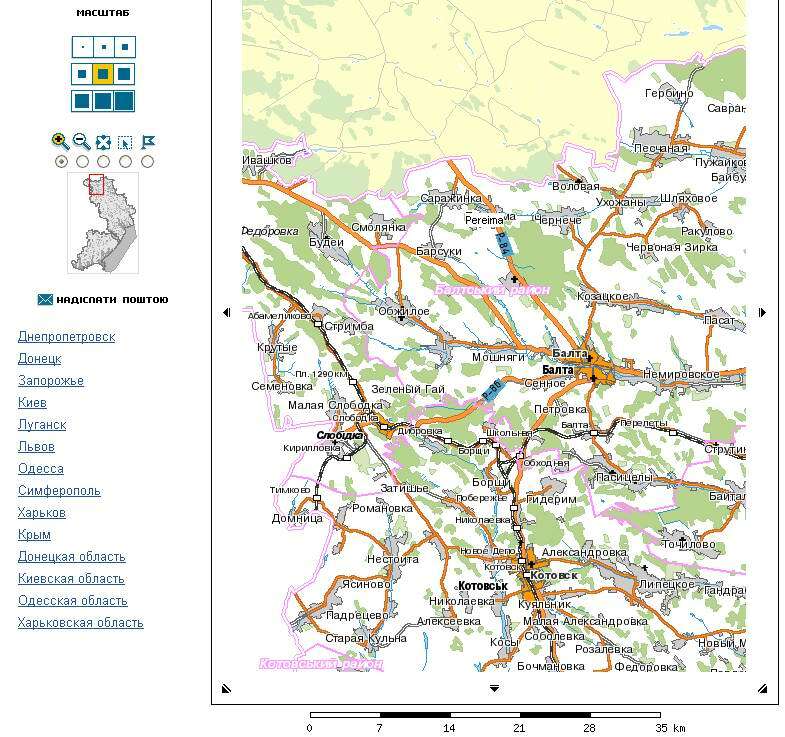 Barbara asks: I am trying to find a village podillya in the halych region, ivano frankivsk oblast and the village kuropatniki, also hlaych, ivano-frankivsk. Thank you. 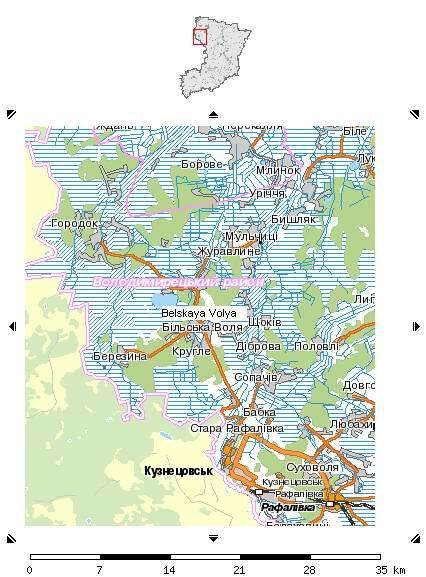 I have found both villages on Ivano-Frankkivsk oblast map (underlined). Petro asks: Where is the village of Podsosnov located? The village Podsosnov is located in Pustomytovskiy area of Lvov region. Forest Green asks: Where in Ukraine is the town of Bynchykovka? Bynchykovka is a village situated in Luhansk oblast of Ukraine (Belokurakinskiy region). Geographical coordinates: latitude 49.4820° / longitude 38.6452°. I think you mean Novoukrainka city. It is the center of Novoukrainian region of Kirovograd oblast. The population is about 19100 (2006). Phone code +380 5251. I have found the following. Selo Zadilskoe #1 is situated in Lvov oblast, Skolevskiy district (raion). Selo Zadilskoe #2 is situated in Zakarpattya oblast Voloveckiy district (raion). The postcode you mentioned is similar to postcodes of main cities and towns of Lvov oblast, so I think the first Zadilskoe is the one you need. Ricardo asks: What about Obertin or Obertyn? The city of Obertin is situated in Ivano-Frankivsk region. It is one of the cities suffered from German invasion during the Second World War. Patty Campbell asks: Where is the village of Minitsa? I couldn't find any info concerning village Minitsa. May be you mean Vinnitsa city? meryl asks: Is there a city and state named Oborony, Lugansk in Ukraine? There is no such city in Ukraine. The word «Oborona» is translated from Ukrainian to English as «Defense». It is a very popular name of the streets in Ukraine cities in memory of World War II. Janet asks: Where is the village of Senkiw in the Ukraine? The people from Senkiw, Ukraine established the oldest Ukrainian colony in Manitoba Canada in 1896. I could find two cities called Senkiwka (I think one of them is the city you are looking for). First one is in Kiev region, on the East from Kiev between Borispol and Barishivka. The second Senkiwka is in Chernigov region.